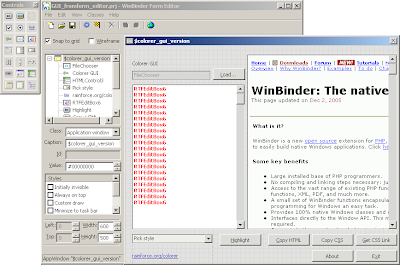 Great tool to create Windows GUI applications with PHP - WinBinder was once my favourite toy. Supplied with very easy to follow examples and a great-looking form designer, seemed like it is capable to not only become a standard for making Windows interfaces for PHP, but also the tool of choice for Rapid Application Development. But the progress goes on and Windows is no more preferred desktop system among developers. Many choose Linux, some folks stick with BSD and of course a lot of people fall in love with MacOS. Windows is no more as popular as before and everybody understand that making your application with PHP + WinBinder limits its widespread usage. It is a pity to know that such a great toy may have no future as every effort needs support and maintaining PHP to C bindings for Windows API takes a lot of time and requires a lot of specific knowledge. Although the code for WinBinder is very well structured, the less is developers base the less chances the project has its bugs to be fixed in time. Most WB users are PHP folks and there are not many with required C experience among them. Thanks Rubem Pechansky for inventing this fabulous toy and let's hope that one day cross-platform GUI building toolkits like wxWindows let us create similar nice, fast and nifty appications. Sometimes it may happen that a system blackbox arrives at your desk together with a person begging to do something to make it work again. It may have been hardware failure, power outage, virus or just a prank that made this panicked person pull the plug out of the outlet and shamefully accept that "I am afraid to turn it on after that!!" What should be the first reaction? Backup what is left. There are tons of backup software available, but most of it just copy files from one place to another on a regular basis. What you need in this situation is to copy a whole disk to network drive without booting the system preferably on the same hardware to avoid mounting HDDs. 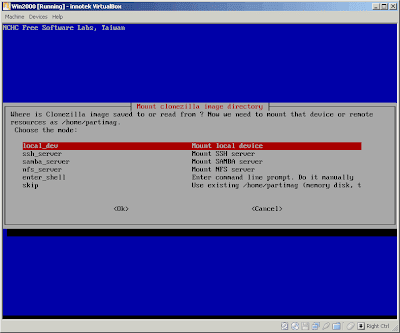 This is a task for disk cloning tools. Next is Clonezilla - wizard interface. No FTP. Only SSH, SAMBA or NFS server that needs to be mounted for an image file. For folks without Linux experience the most complicated stuff is probably to understand "mount clonezilla image directory" dialog which basically means to attach "share" where image files can be stored (sorry for the lame comment). Saving partition image worked like a charm - not only it displayed progress window, but also detected space in use! and saved only used part. Magic! I just wonder if I'll be able to restore image manually in case Clonezilla fails. In directory with image file there are text files with disk and partition parameters, but image file itself is in custom format. In case of NTFS system - in ntfsclone 2.0 To conclude - Clonezilla version 1.0.9-10 CD is nice and usable, but a single mistake during wizard requires to start the process anew. Let's skim over alternatives. Ghost for Linux - doesn't have its own web-page - only standard SourceForge project template, but provides ISO image for downloads. The project itself is similar to g4u - the same FTP upload method with compression, but much better interface. Version 0.24 is GPLed and Linux-based. In comparison g4u is BSD-licensed and NetBSD-based. Ok, about the contents. Multiple boot options varied mostly by linux kernel. Weird. I do not want to try every one to find out which of them will do the job. Good reference is shown right after startup documenting two options, but lazy one would prefer only the first - to enter "g4l" at command line to start wizard interface. This preferably could be just one line reminder before the system proposes shell. The nice thing about g4l wizards is that they allow to go back to correct options. 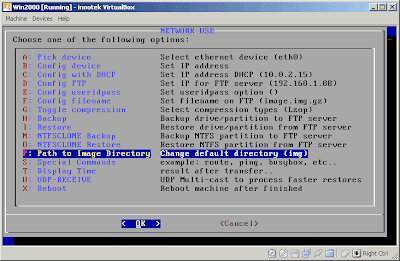 Nevertheless, the real test failed on VirtualBox, because there was no default 'img' directory on FTP, and even though g4l created it, it hung afterwards. After manual restart and mkdir 'img' on FTP the process successfully completed. It can be FTP or VirtualBox bug - no idea, but with this minimal correction the test passed. Resume: setup is minimal and intuitive, though partition selection doesn't give any info about partition type. Ideal for FTP backup, but for other network access types I would still prefer Clonezilla. g4l like Clonezilla includes ntfsclone utility for NTFS backup, but its version is slightly outdated and should be selected explicitly. If you remember - there is no partition information displayed. PartImage doesn't have its own Live CD, but seems to be the tool of choice used on PING "Backup and Restore Disk Partitions" Live CD and on SystemRescueCd. PING 2.01.10 is even more simple than Clonezilla, includes wizard interface, for network storage supports only SMB shares and requires that a predefined set of directories is already created in the destination share. This predefined set is only described on official site and that's strange, because Clonezilla manages to create all required directories automatically. So PING is not an option for burn-and-boot solution. Another annoyance is that Alt-Tab pressed within VirtualBox ends PING session prematurely. Too bad. Let's see the last one. At last! To backup your disk or partition via SSH, SAMBA or NFS use Clonezilla. For convenient backup to FTP use g4l.